In this remake of the classic 1960s series, the squad car may have the same name but the riders have changed. 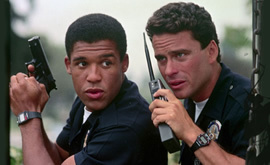 Officers Gus Grant (Peter Parros) and Matt Doyle (Ethan Wayne) are members of the LAPD that go out on patrol in their black and white squad car. On the streets of Los Angeles, things are never boring for Grant and Doyle as they encounter a mix of serious crimes and strange residents. Since African-American Grant is married and Caucasian Doyle is still playing the field, the work partners also have plenty of interesting conversations on the job. Keeping an eye on them and the rest of the squad is Sergeant Harry Santos (Miguel Fernandes), the team’s no-nonsense watch commander. As a convicted cop killer is slated to be executed, Grant and Doyle try to head off a gang war. A former Latino gangmember, who is now a champion boxer, tries to help. The officers also make an arrest in a stolen car case but the owner of the auto isn’t happy with the results. First aired: September 16, 1991.